I tried reading something else to pass the time while waiting for book 7 to arrive but nothin' doin'. I can't read about or think about anything else until I complete the series. (This is also the case because I am now terrified that someone is going to spoil the end for me before I get to it myself.) I decided that since I can't really think about anything else, I might as well write up my thoughts on the titles I've already completed. As you might recall, I finished up book 3 with some concerns about the introduction of the subject of divination. My same concerns can be applied to every Potter book I've read since. The further along you read, the more they discuss the topic and the more the characters dabble in it. It's an inescapable "flaw" in my being able to relax with the books in total because the Bible is quite clear on the subject: it is not to be done. No ifs, ands or buts. You can't just ignore this issue in these books. You need to acknowledge it. 1. As mentioned, the magic between the two series is quite distinctly different. In Narnia is there is "white magic" and "black magic" and never the two shall meet. There is a clear distinction between good and evil. In the Harry Potter series, there is only one type of magic but it is being used to different ends. The "good guys" use the same spells and curses against the "bad guys". It's not that their magic is different, it is that it is simply used differently. 3. It disturbs me that Christians say that you can read Harry Potter because of the "fact" that Rowling is a Christian too. To follow that argument, you would say that if something (anything!) is done by a Christian is must be good. First, I don't think Rowling actually is a Christian. (I've already argued that.) Secondly, a person's faith doesn't actually factor in to my decision over whether or not I would read any given book and I don't think it should factor into yours either. I do not believe that scriptures in any way argue that you can only a.) read scripture alone and/or b.) only read books written by those who share your faith. Certainly you are to be wise and discerning about what you read but truth can be found even in the works of non-Christians (as even a non-Christian is made in the image of God and has the ability to proclaim truth and beauty). This is a long(ish) argument to be making but I'd like to get to my main point so I'm going to wrap up this argument and say, "If you want to read Harry Potter - do. Go ahead. You are at liberty to do so if you so desire. Just don't do it because you think Rowling was a Christian. That shouldn't be the basis of your decision. Nor should anyone try to make Harry a Christian just to ease their conscience somehow. Like him as-is and in a truthful manner. 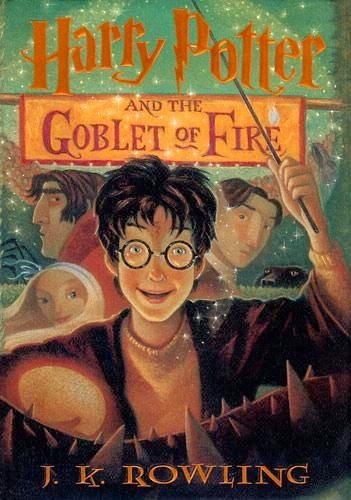 The Goblet Of Fire is, perhaps, darker than the first three stories but it is the book which drew me in the most, launching me immediately onto books 5, then 6, with a hasty Amazon purchase of book 7. Since I'm hoping to read to the end of the series without anyone offering a spoiler, I'd like to be careful in my review not to mention anything which would ruin surprises for anyone else. I'll be very general in my remarks. ". . . [W]e are only as strong as we are united, as week as we are divided. Lord Voldemort's gift for spreading discord and enmity is very great. We can fight it only by showing an equally strong bond of friendship and trust. Difference of habit and language are nothing at all if our aims are identical and our hearts open." We Christians know, of course, that we have an enemy who seeks to kill and destroy. Satan also knows that it is easier to destroy us as individuals and therefore is eager for us to separate ourselves from the Church (i.e., the Body of Christ). When we are alone, we are weaker than when we are surrounded by like-minded believers who can help encourage us, build us up, and keep us standing strong. This is not the point that Rowling was trying to make but it certainly does resonate as a great truth with me that the Body of Christ needs to stand together and work together, being ready to enjoy victory together. That was an encouragement to me amid the story itself. You should know that this is a book series I am very much beginning to truly enjoy. I do not enjoy it because it is "like Narnia" -- because it isn't that at all. I like it because it's a complex story with fantastic character development and a novel setting with an exciting plot line. And I really, really, really need for the seventh book to arrive at my house. SOON. I read the books, and I agree with you completely. I hadn't actually heard that Rowling was a Christian, but I think it's hard to argue that from the books. And, yes, the magic is very different from Narnia. Having said that, I don't think Christians should ignore these stories outright. There are things to enjoy in them. But we need to be very discerning as we read them, which is exactly what you are going. Incidentally, I had seen the movies, but I waited until the last book had a publication date before starting to read all of them. I finished book 6 two weeks before book 7 came out, and it was a long wait. I can't imagine waiting the two years every one else did. I agree with your take here. They're not great books or profound books or spiritually essential books, but they are fun, intriguing reads. And they don't need any justification beyond that. I think that the notable difference in the magic systems is that the magic exercised in Narnia, and in Middle Earth for that matter, is almost always magic that is inherent to the nature of the user. I think this is important because the problem with witchcraft scripturally is that of seeking power. I think that it is tied to rebellion for reasons that cut both ways. The use of or quest for magic in our own world is a quest for greater power than we are imbued with by God, thus it is fundamentally a rebellious, or unsubmissive goal. When magic is a natural outworking of who you are, it doesn't have that factor. Gandalf was created to exercise the power which he uses. There is nothing rebellious about it. Mechanistic magic clearly is more morally ambivalent than inherent magic. However, I don't think that it shouldn't be part of books. Creating a world of difficult moral choices is just a reflection of our world. However, it does make missteps more likely and really puts the author's morality to the test. Giggle tee hee. You DO know you're killing me, right?! I would love to go hibernate for a couple weeks and read the entire series again. I thoroughly agree with your thoughts. Potter is not even close to Narnia. However, it is an excellent escape into a wonderful plot, characterization, and storytelling. Interestingly, I've had someone challenge me (it might have even been you?) that HP might not be good to read for this very reason--that she is such a good storyteller and one escapes into the story, possibly leaving their "thinking caps" behind. Honestly, however, I am simply delighted that you are enjoying the story and her writing as well. (Isn't she marvelous at creating an alternate world?!) I am quite sad that I've heard Rowling's more recent books are decidedly ADULT bc I would love to escape into her storytelling again, but am not willing to wallow in muck to do so. I do agree that all truth is God's truth and even non-Christian people can convey spiritual principles sometimes. It does make me sad that some Christians see these universal truths in a work and try to make the writer a Christian - people need more discernment. Still haven't read these and not planning to - just have too much on my reading plate as it is. So glad to hear your thoughts. You articulate them so well. Just shared on FB and pinned it because I need to come back to reference it at times. :) I only read the first book. I have had the HP books on my TBR list for a few years now. Other books on my list always seem more urgent. Thanks so much for sharing your thoughts.